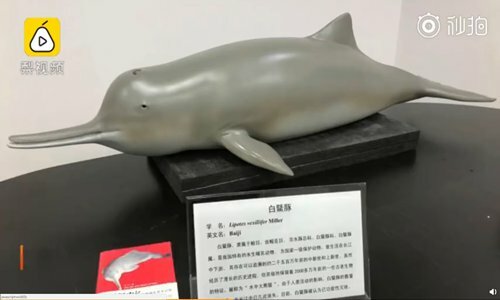 An exact replica of Qiqi the "much loved" Baiji river dolphin who died in 2002 after living in captivity for two decades has gone on display at a museum in Wuhan, Central China's Hubei Province. Baiji dolphins are now considered "functionally extinct" and Qiqi, who was rescued from a fishing net in the Yangtze River, was one of the last surviving members of the species and the only one to ever live in captivity, Pear Video reported on Saturday. The more than two-meter-long replica of Qiqi faithfully depicts her gray upper body, triangular dorsal fin, white underbelly and distinctive long snout. It also shows Qiqi's scars from injuries she received from her tangle with a fishers' net. "I found Qiqi was much loved and many people asked if we had samples of her we could display and this gave us the idea to create her replica," said Zhang Xianfeng, the museum curator, adding that the exhibit also serves as an alert to the public to protect endangered animals. Scientists spent two years creating the replica using 3D printing technology. "It's just a start. We'll work on building more replicas of other rare animals," said Zhang. Baiji dolphins are freshwater dolphins that lived in the Yangtze River. The dolphin was declared functionally extinct in 2007.